CIShell supports the plug-and-play of datasets and algorithms and their bundling into custom tools that serve the specific needs of a user group or research community. It has been applied to develop diverse custom tools, see below. Feel free to take plugins from any of these tools to design your personal dream tool. 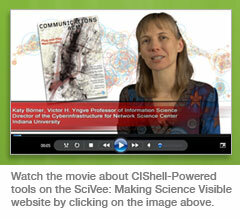 Provided by the Cyberinfrastructure for Network Science Center at Indiana University. Learn more about existing CIShell-powered tools below. The NWB Tool supports researchers, educators, and practitioners interested in the study of biomedical, social and behavioral science, physics, and other networks. It comes with a 77-page user manual . The Sci 2 Tool was specifically developed for science policy makers and researchers that study science by scientific means. It supports the temporal, geospatial, topical, and network analysis and visualization of scholarly datasets at the micro (individual), meso (local), and macro (global) levels. There exists a 112-page user manual, a continuously updated Sci 2 Tool wiki, and 24 hours of NIH tutorials in this tool. The EpiC Tool supports the custom analysis, modeling, and visualization of data streams such as diffusion patterns of the H1N1 virus over geographic space. TexTrend is a trend- and text-analysis tool that supports business and governmental decision making. It is under development by a European consortium and financially supported by the National Office for Research and Technology. Video tutorials are available online. Coordinated by Peter M.A. Sloot at the University of Amsterdam, The Netherlands develops algorithms to study evolving networks. An Observatory for Science in Society Based in Social Models. Börner, Katy. 2011. " Plug-and-Play Macroscopes". Communications of the ACM. Vol. 54(3), 60-69, ACM Press. Börner, Katy, Huang, Weixia (Bonnie), Linnemeier, Micah, Duhon, Russell Jackson, Phillips, Patrick, Ma, Nianli, Zoss, Angela, Guo, Hanning & Price, Mark (2010). Rete-Netzwerk-Red: Analyzing and Visualizing Scholarly Networks Using the Network Workbench Tool. Scientometrics. Vol. 83 (3), 863-876. Börner, Katy, Ma, Nianli, Duhon, Russell Jackson & Zoss, Angela (2009). Science & Technology Assessment Using Open Data and Open Code. IEEE Intelligent Systems. Vol. 24 (4), 78-81, IEEE Computer Systems. Herr II, Bruce W., Huang, Weixia (Bonnie), Penumarthy, Shashikant & Börner, Katy (2007). Designing Highly Flexible and Usable Cyberinfrastructures for Convergence. In Bainbridge, William S. & Roco, Mihail C. (Eds. ), Progress in Convergence - Technologies for Human Wellbeing (Vol. 1093, pp. 161-179), Annals of the New York Academy of Sciences, Boston, MA. Kampis, George; Gulyas, Laszlo; Szaszi, Zoltan; Szakolczi, Zalan and Soos, Sandor (2009), " Dynamic Social Networks and the Textrend/CIShell Framework", Presented at the Conference on Applied Social Network Analysis (ASNA): 21. PathVisio ( http://www.pathvisio.org) that visualizes WikiPathways ( http://wikipathways.org). Cytoscape ( http://cytoscape.org) led by Trey Ideker at the University of California, San Diego, is an open-source bioinformatics software platform that enables visualization of molecular-interaction networks, gene-expression profiles, and other state data. Taverna Workbench ( http://taverna.org.uk) developed by the myGrid team (http://mygrid.org.uk) led by Carol Goble at the University of Manchester, U.K., is a suite of free open-source software tools helps design and execute workflows, allowing users to integrate many different software tools, including more than 8,000 Web services from diverse domains (such as chemistry, music, and social sciences). MAEviz ( http://mae.cee.illinois.edu/software/software_maeviz.html) is managed at the National Center for Supercomputing Applications. It is an open-source, extensible software platform supporting seismic risk assessment based on Mid-America Earthquake Center research in the Consequence-Based Risk Management framework. This work is supported in part by the Cyberinfrastructure for Network Science Center and the School of Library and Information Science at Indiana University, the National Science Foundation under Grant No. SBE-0738111, IIS-0513650, NIH RM-07-004 award, and the James S. McDonnell Foundation. Any opinions, findings, and conclusions or recommendations expressed in this material are those of the author(s) and do not necessarily reflect the views of the National Science Foundation.